This drama features 18-year-old characters growth and their anecdotes happening at a prestige boarding high school with a high college entrance rate. One day, cheering club Baekho with honor students and dancing club Real King with problem students unified as a cheerleading club. What will happen when they are gathered for a cheerleading? Dance club Real King's leader. Yeondu used to known as a faithful and popular student when she was in middle school. Yet, now she is nothing but a troublemaker at Sebit High School where students are only rated by their grades. Her only hope in this suffocating school is her dance club "Real King". Real King's members are gathered only because they love dance. However, the school regards Real King as a gathering of students who only cares about dating and keeps a sharp lookout for them. Yeondu and Real King members are busy preparing for the upcoming dance competition. One day, Real King members had an argument with Baekho, top students' club and because of "kissing photo incident," the two club ends up being dissolved. Club Baekho's leader. Top student at Sebit High School. Everyone knows this good-looking and smart student of their school. He looks like a chic student, but also has a carefree thought which can be hard to be controlled in Korean education system. Even the principal doesn't know what to do with him since they need good graders like him and the school has been sponsored by his father. Also, he is the leader of Baekho, the cheerleading club. Only top students can join the club. He doesn't really interested in cheerleading or being the leader of the club until he gets in trouble because of "kissing photo incident" with Yeondu. Favourite sports: Basketball. Favourite Food: Strawberry milk. The End. He only cares about what he likes and is carefree with the rest of it. His appearance attracts many girl students, but he doesn’t know his fan club name or recognizes their faces. 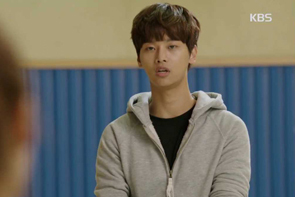 His only concern is Kang Yeondu who has been his friend since elementary school. He follows Yeondu all the time asking everything. Thus, people call Yeondu as Dongjae’s mother. He is the top player at school's basketball team. His sharp and accurate three-pointer is his No.1 skill. However, there is one thing which makes him so embarrassed is physical contact with others.